I owe an extra thank you to Cathleen for giving us her kids' activity center. Cathleen told me though this thing is not aesthetically pleasing, it is incredibly useful to have five minuets to yourself in a given day. 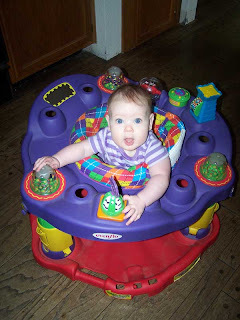 Alice LOVES this baby gym and reacted to it like I had given her baby crack. There was lots of screaming and joyous wiggling followed by an equal and proportionate amount of crying when her senses overloaded. I actually removed most of the toys as she was getting the shakes from too much input. Now I have a working method where I move the kid in a rotation from this thing, to my lap, to the floor, to the playpen, back to my lap, and so on until it is naptime or I have (miracle of miracles) completed a task. You're welcome! We miss you guys. Hee, you can almost see the "Sensory Overload" sign light up over her head. What's this? A new comic you say?